Goulds History of Freemasonry Vol I. p. 104. 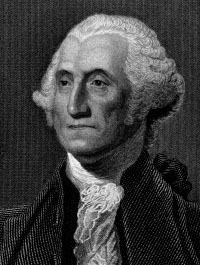 George Washington was Commanding General of the American Continental Army during their War of Independence (1776-1781). He was President of the Constitutional Convention in 1787 and from 1789 to 1796 was the first president of the USA. Contrary to the discredited claims made by Governor Ritner (1780-1869)2 in 1837, Washington remained a freemason until his death, whereupon, at his widows request, he received a masonic funeral. While his continued membership and regard for Freemasonry is unquestionable, his personal papers suggest that he may not have been a frequent attendee at lodge. 1. Claude Harris, Esoteric Symbolism of the Watson-Cassoul Apron, Alexandria Lodge No. 39, 1998. 2. Vindication of General Washington from the stigma of adherence to secret societies, by Joseph Ritner (1780-1869) ... Communicated by request of the House of representatives, to that body, on the 8th of March, 1837, with the proceedings which took place on its reception. Harrisburg : Printed by T. Fenn, 1837. 26 p. 21 cm. 3. Correspondence from George Washington to Massachusetts Grand Lodge of Masons, December 27, 1792, reprinted in A Treasury of Masonic Thought, Carl Glick, ed. New York : Vail-Ballou Press, Inc., 1959. p. 204.